Like a good snowstorm the cutoff between beneficial rain and nah will be a matter of miles tomorrow. The National Weather Service has issued a flood watch for SE MA, RI and CT. That doesn't include Worcester County has the bulk of the moisture will be closer to the South Coast. Here is the current radar for the entire Northeast. 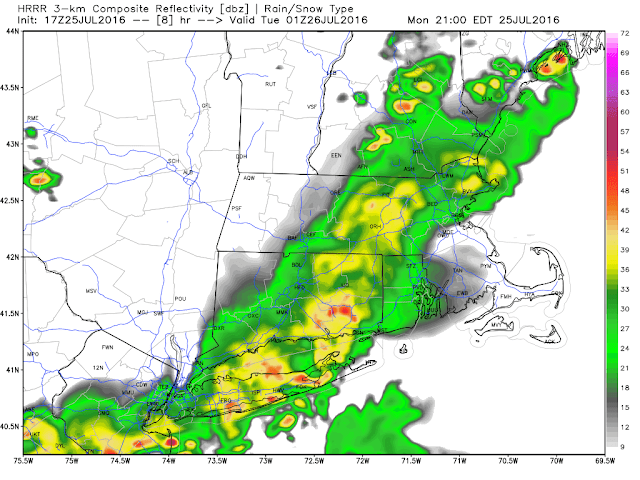 The activity in Northern New England is from an approaching cold front. A surface low has formed in the Mid Atlantic. This will track Northeast and link up with the northern front that will stall near the South Coast. Now extremely tropical moisture will be in place. Our wind is out the Southwest. On this water vapor satellite loop (which tracks the amount of moisture in the atmosphere) track the flow from the Atlantic and Gulf of Mexico into the Eastern United States. Notice the brighter colors over Long Island? There could be some stronger thunderstorms near the center of this low. Severe weather parameters are quite high for the South Coast/Cape and Islands. A brief tornado or waterspout is possible. We really need this rain. According to the Whitinsville Water Company we are now nearly 13" below normal dating back to January 2015. June and July have been bone dry as well with less than 4" of rain combined. That has lead to a Drought Watch. A drought watch has been issued for out region as of July 1. Most towns around us already had issued water bans but until today Sutton and Northbridge had not. The water restrictions will be effective Friday July 29th. A Stage 1 Water Restriction entails a voluntary restriction on all non-essential outdoor water to odd/even days. This means that if your house number is an even number (ends in 0,2,4,6,or 8) , we would ask that you only water on even dates either before 9am or after 5pm on that day. And if you house number is an odd number (ends in 1,3,5,7 or 9), we would ask that you only water on odd dates either before 9am or after 5pm on that day. If you have a shared irrigation system, we ask that you set the timer to run only on even days either before 9am or after 5pm. to meet the core functions of a business (for example, irrigation by golf courses as necessary to maintain tees, greens, and limited fairway watering, or irrigation by plant nurseries as necessary to maintain stock). The reason for watering before 9 AM and after 5 PM is simply because the process of evaporation in the peak heating hours does more damage to whatever it is one is trying to water by adding extra energy. So please follow these guidelines. 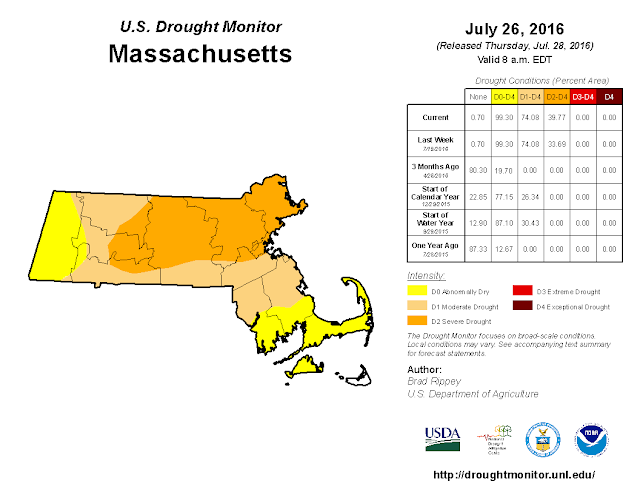 Here is the updated drought monitor. Like I said we really need this rain tomorrow but there is no guarantee we get enough to make a difference. Sing it Luke! Friday evening was wild across Southern New England. 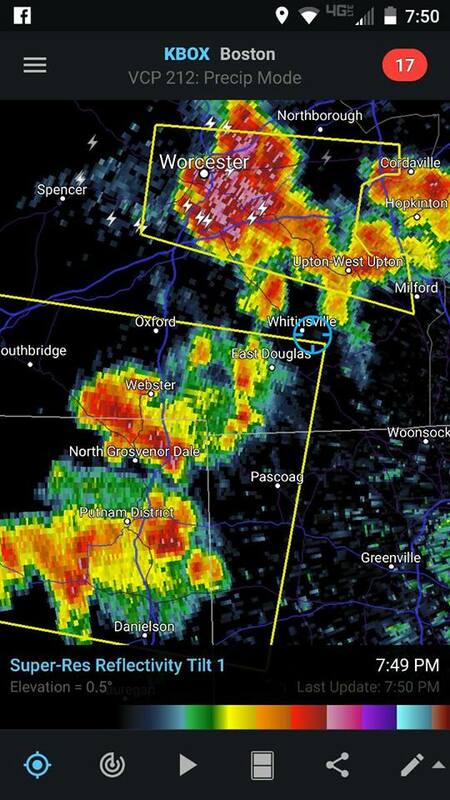 Although we could see lightning and hear thunder most of the Blackstone Valley was spared the strongest thunderstorms. 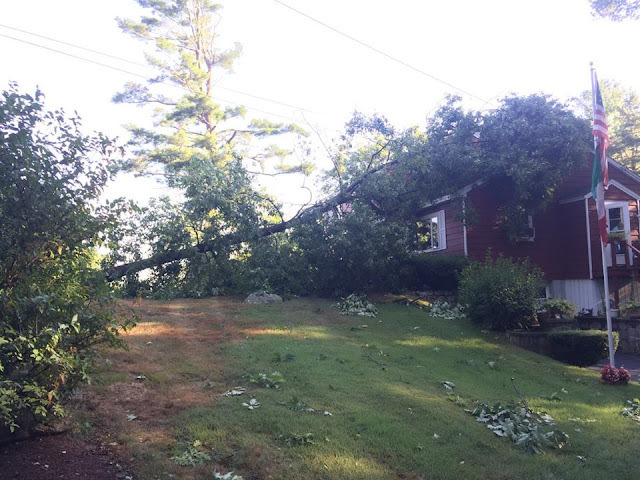 A severe storm ripped through Worcester, Grafton, Westboro, Southboro and Framingham (among others). Another severe storm tore through Northern Rhode Island and treated us to one hell of a light show last night. A lot of weather enthusiasts root for severe weather but it is important to remember the power of these storms and the destruction they can cause. For many folks across the commonwealth today is not a fun day. That said the power of mother nature is second to none. A threat of thunderstorms also exists this afternoon and tonight. The surface chart this morning shows high pressure in control to our Southwest and a cold front to the northwest. That doesn't make it cool- we don't live at 18,000 ft. 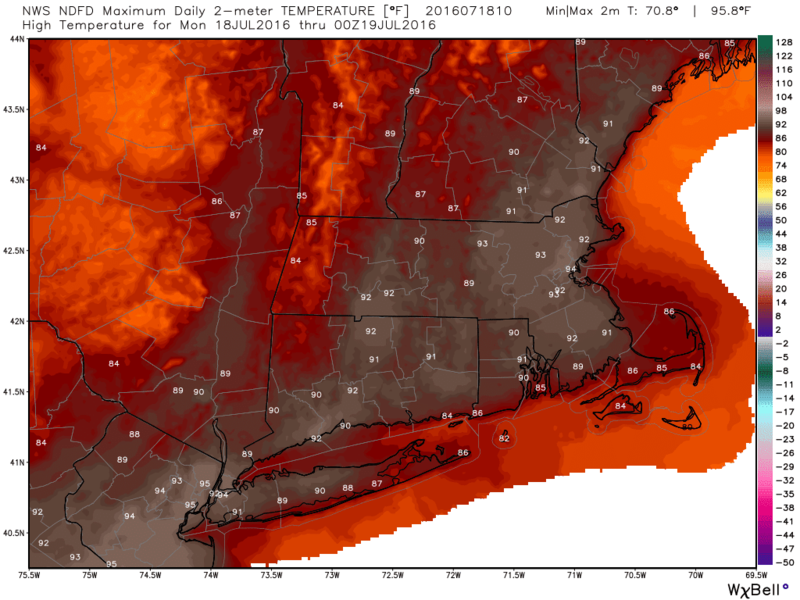 In fact it is already 91 in Boston! The record if 100 set in 1952. The city will probably settle around 97-98 but this is an impressive start. Most weather stations in the Blackstone Valley are reading close to 90 as well. 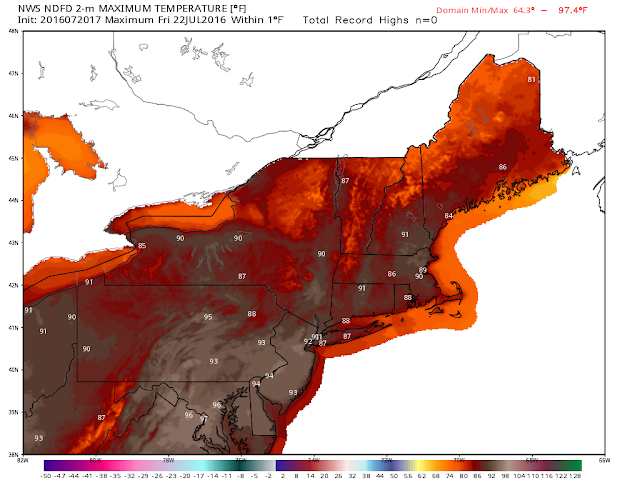 With all this heat and an upper level feature expected to cross the region this afternoon expect another round of showers and thunderstorms. Here is the simulated radar as of 6 PM. This is not meant to be exact- just a representation of where the model thinks convection will fire later. In this case it makes sense that most of the action is in Northern New England closer to boundary. It isn't a great Saturday afternoon at the Northern New England beaches. Hopefully Roger Goodell is home. 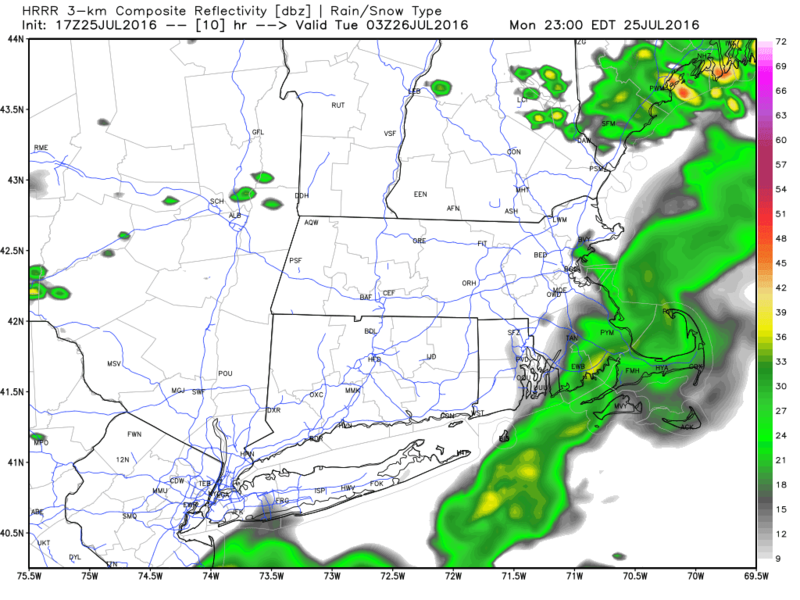 Some of this action will spill into Southern New England. Dry conditions continue across Southern New England. 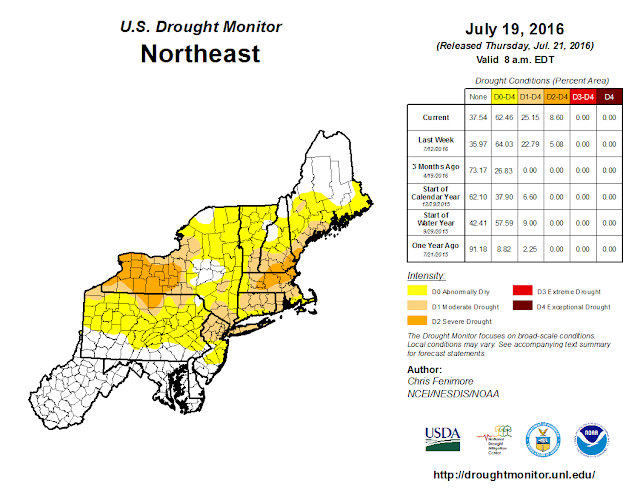 The area of moderate and severe drought continues to expand. The dryness started in 2014. Hurricane Arthur helped dent the conditions in July of 2014. The heavy snow of January-March 2015 was rather dry and fluffy so that did not do much to alleviate the problem. 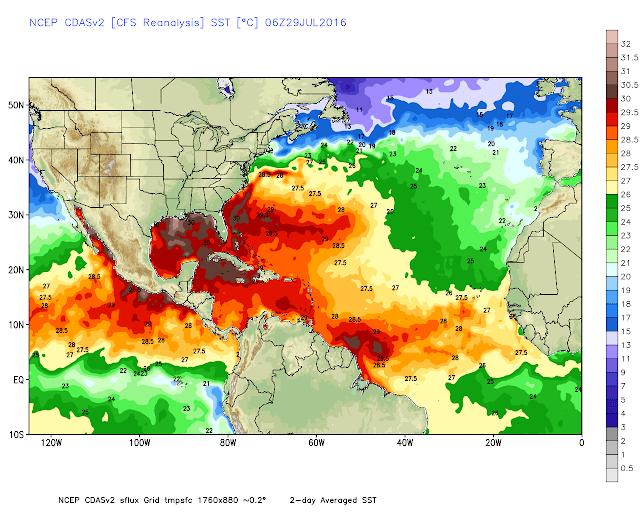 After some relief in June of 2015 (Tropical Storm Bill) we went right back to dry. I decided to do some research and I've found a lot of information. The first chart shows the latest drought monitor. 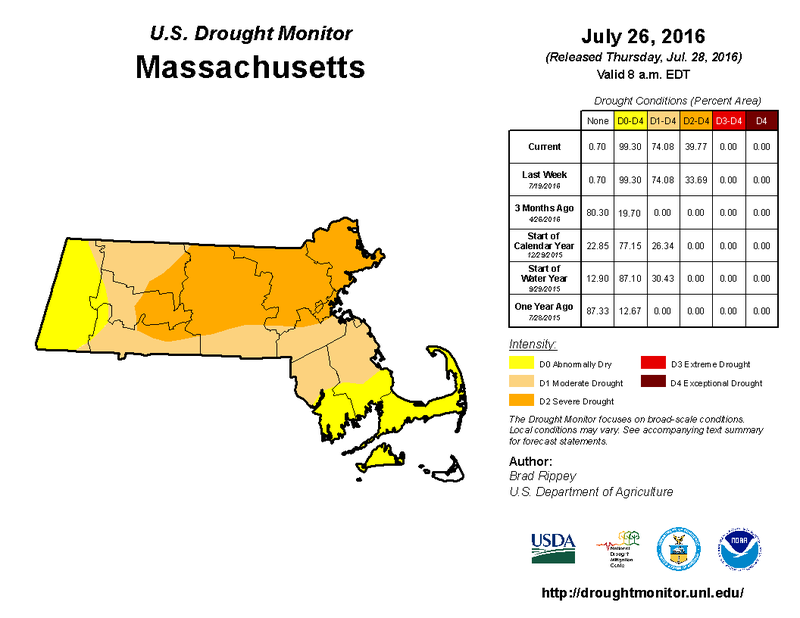 Severe and moderate drought has conquered more area with this update. 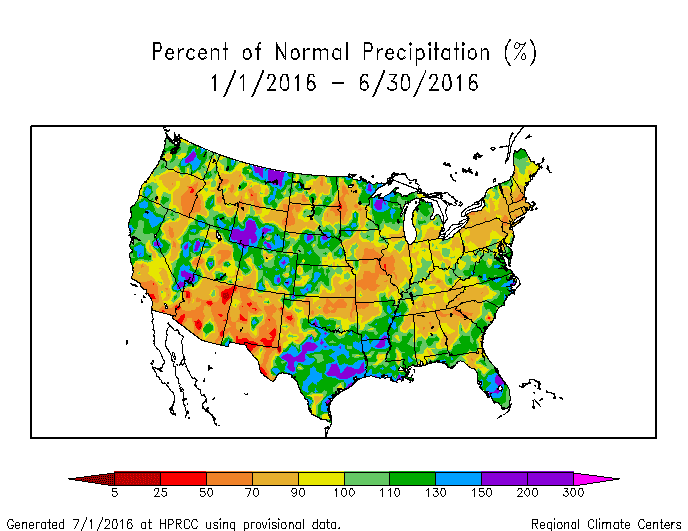 The second chart shows the percent of normal precipitation for the first half of 2016. We are running around 75% in Southern New England. We ran about 80-90% in 2015. So why exactly has this happened? There are two main reasons. The current reason is the general jet stream set up. It features a trough off the Pacific Northwest Coast and a trough off the East Coast. Normally that means cooler and wet but we are on the dry western side of the trough. Also we are close enough to the ridge every few days we are getting close to 90. That ridge however takes most of the storms and pushes them to our south. So West Virginia has had bad flooding and plenty of rain. Virginia and Maryland have as well. Last night's upper air chart shows this pattern well. The ridge in the Atlantic subsequently weakens cold fronts as they head towards New England. So the patterns allows for disturbances to ride above the ridge but by the time they get to the Northeast they are rather weak. 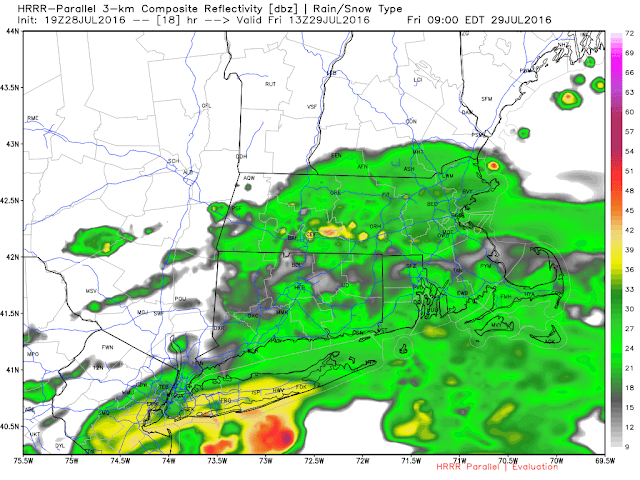 That means scattered thunderstorms which don't really help the drought. It rains hard for a half hour and we might pick up a half inch of rain but it runs off into the storm drains without being able to soak into the ground. As for the Atlantic it seems like it is in a period of transition. From 1995 until 2012 or so the basin was hyper active with tropical cyclone activity. All oceans do through phases where a warm or cold state is favored. They also transition to these phases. One Atlantic transition from warm to cold occurred in the 1960's. The Atlantic was active from 1925-1965 (give or take) but it began to transition in the later part of the 1950's. Interestingly enough a rather severe drought began in 1961 that continued through 1969 (Harkness et al, 1986 pg 30). The drought peaked in 1965-66 (Copeland 1966). This period of dryness really began in 2014 so history tells us this could (but likely will not) last awhile. The Quabbin reservoir fell to 45% capacity in 1967. Communities faced water restrictions and watering bans. The Quabbin was built after the 1929-1932 drought. In fact several towns were moved in order to create the the water supply. Eastern MA communities were hit hard in the early 30's and they needed to create more water supply. The Quabbin can hold 416 billion gallons of water and it services over 18 communities. So how is the Quabbin doing today? The Quabbin is 90% full as of July 1. So despite a severe drought the water supply is fine. Here is the summary off the Massachusetts Water Resources Authority website. I reached out to WWC to find out how filled our reservoirs are and I am waiting to hear back. My guess is we are doing okay . Uxbridge water (despite the E. Coli issue and the contaminated soil near the water supply) looks to be nearly full (UPDATE 7/22/16 Uxbridge has a water ban more on this Sunday). So our lawns are turning brown, its dusty and fire danger is elevated but our water supply is in good shape, This is obviously something to pay attention to going forward because I don't see the pattern changing anytime soon. 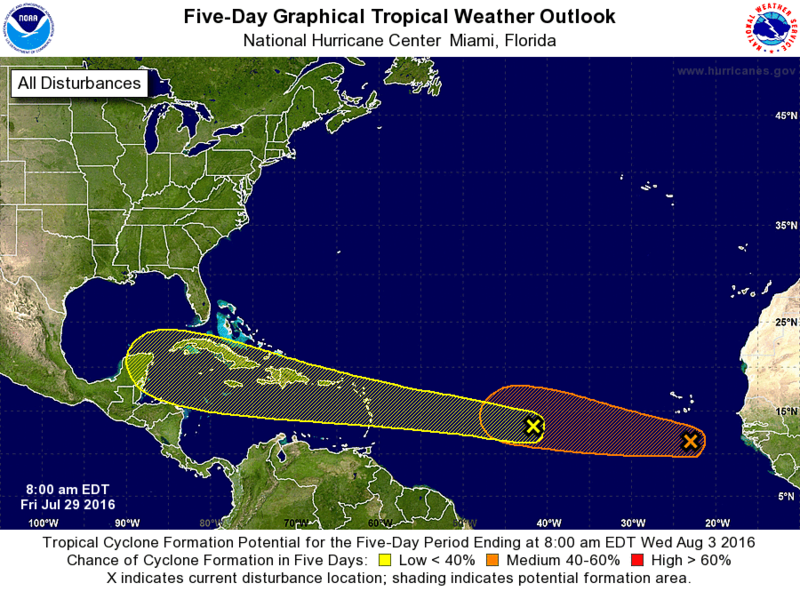 We could use a tropical system but we don't want to go from drought to flood and then right back to drought. All in all this nothing compared to the issues in California but we don't live in California. Another note I found interesting was that there was a drought from 1980-1983. It was before my time but I was told the gypsie moths were horrible in 1981 and 1983. That makes sense because the fungus that keeps the caterpillar population in check grows best in moist conditions, Unless we turn things around next winter get ready for more caterpillars and moths in 2017. This is a topic that has really got my attention so be on the look out for more posts on this topic if you've found it educational/interesting. 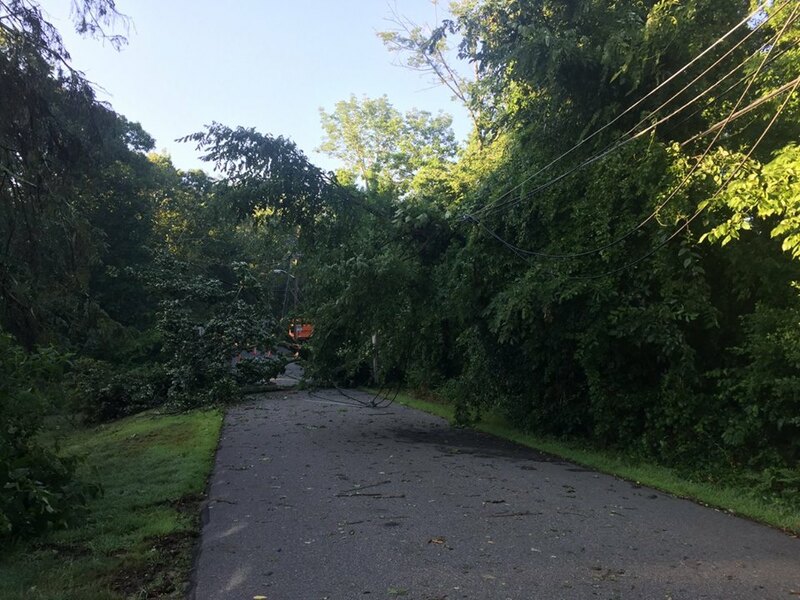 Although the Blackstone Valley was spared yesterday severe weather ripped through Southern New England causing extensive damage in Haverhill, Weymouth, Jamaica Plain and other local communities. 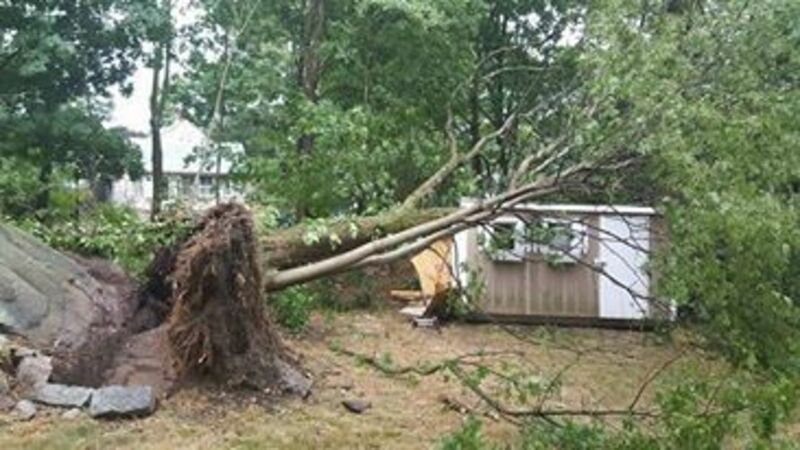 The storm that caused the damage south of Boston formed near Worcester. I expected a squall line to form but it never did. I placed my faith in the high resolution computer models and they let me down in my home area. Two weeks ago we were hit hard in the Blackstone Valley when everyone else missed out. This time it was us- that is severe weather. 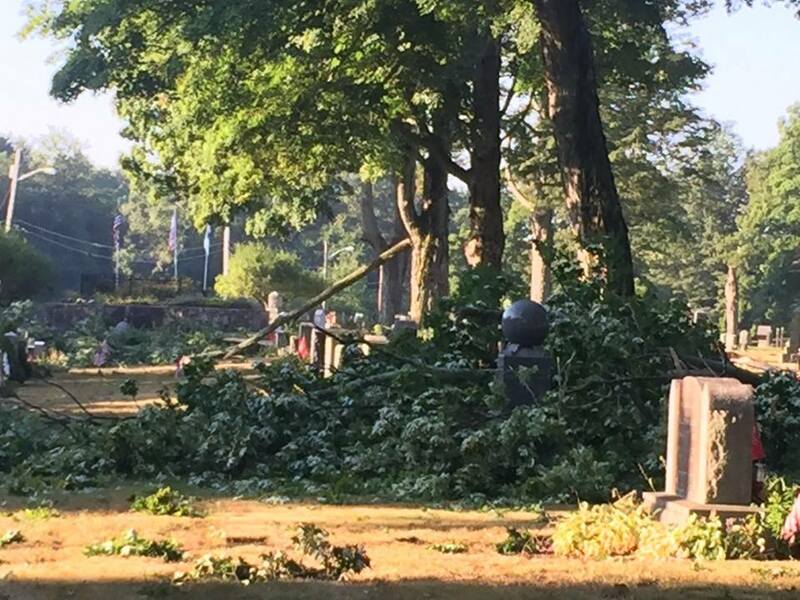 One complex of storms near the MA/NH border seemed to draw a lot of energy from MA into it and results were damage like this in S NH. We will have another chance of thunderstorms on Friday. 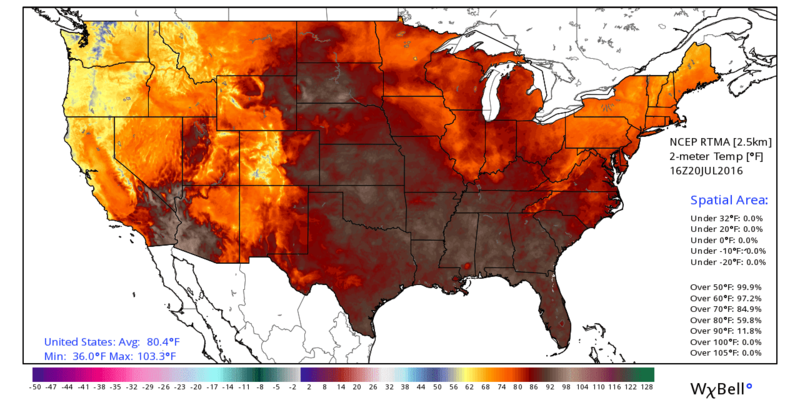 A strong ridge of high pressure will develop over the Central US so most of the country will see extreme heat. In the northeast we will be above average but in general in the upper 80's and low 90's. Perhaps next week the heat will shift to the east coast as the Bermuda high sets up offshore. 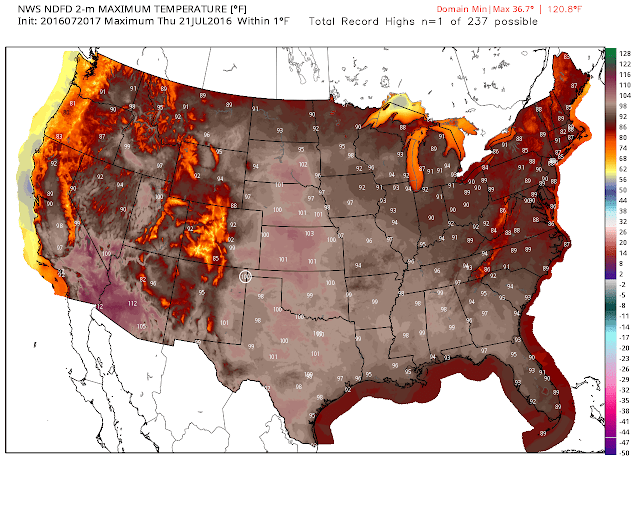 As for today high pressure in the Great Lakes keep us 10 degrees cooler than yesterday with dewpoints 20 points less. Temperatures gradually rise and humidity will increase as the high moves offshore later this week. 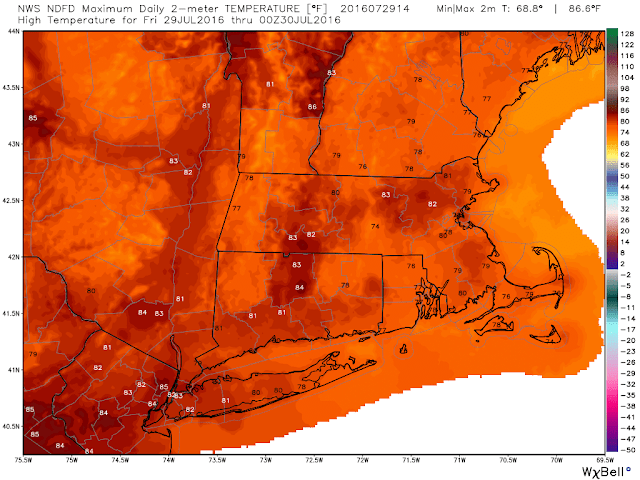 Enjoy the low 80's today and tomorrow- it doesn't get much better than that in July. A cold front approaching from the west will fire off strong to severe thunderstorms this afternoon and evening. Ahead of these storms we will find temperatures in the low 90's. Add in the humidity and it will feel closer to 100. 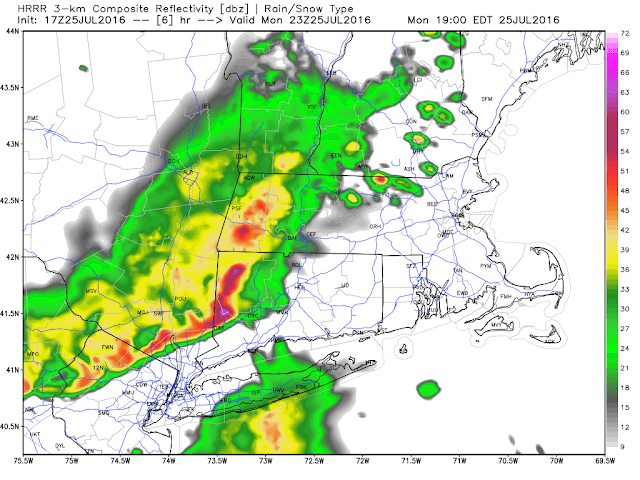 The storms will first impact the Berkshires/western MA between 2-3 PM, Worcester County/Hartford 3-6 PM and Boston/Eastern MA 4-730 PM, Damaging winds are the number one threat today along with frequent lightning. Hail and an isolated tornado (especially Western MA and into New York) are also possible. Here is the cold front as of 2 AM. As the warm front lifts through to our west it will help to re-enforce the heat and humidity providing fuel for the thunderstorms. 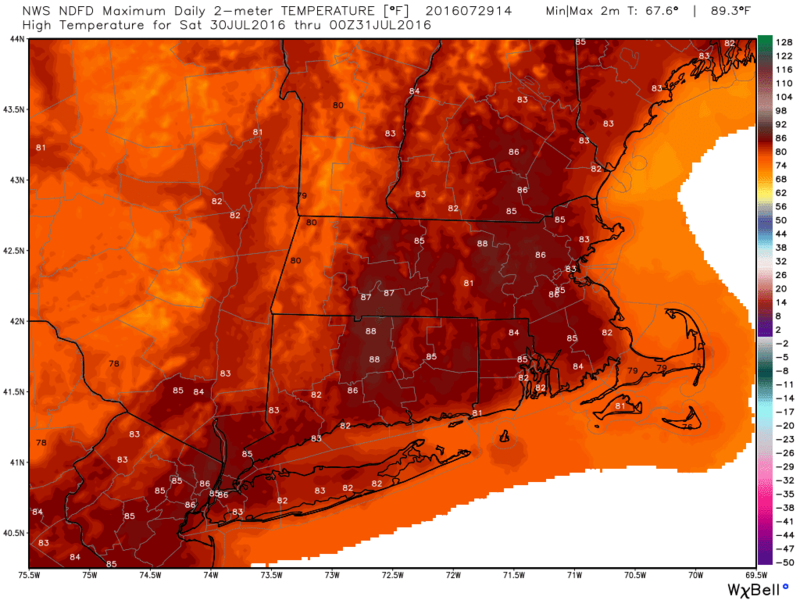 High temperatures today are low 90's although some places in Eastern MA may hit the mid 90's. The cold front is on the move and by 2 PM thunderstorms will be firing well ahead of the actual front. If possible I'll try to live stream a video as the storms roll through.